The first test launch of NASA’s new Orion spacecraft is currently being paced by its “surrogate” launch vehicle, the United Launch Alliance (ULA) Delta IV-Heavy. The EFT-1 carrier rocket is already in production and in the launch queue, according to ULA, while the EFT-1 Orion continues to undergo outfitting operations at the Kennedy Space Center (KSC). Since arriving at KSC from the Michoud Assembly Facility (MAF), Lockheed Martin have been busy outfitting the shell of the EFT-1 Orion ahead of its debut mission. This process is expected to take 17 months in total. The mission will provide vital data for the Critical Design Review (CDR) in April, 2015 – itself a major milestone ahead of Orion’s debut with the Space Launch System (SLS) in 2017. The launch date has slipped several times, with the latest September, 2014 target confirmed at the latest meeting of NASA’s Aerospace Safety Advisory Panel (ASAP) – conducted at the Johnson Space Center (JSC) in Houston. The ASAP comments do appear to match notes acquired earlier in the year, which also pointed a finger at the Delta IV-H, as opposed to the EFT-1 Orion, as the main scheduling item. However, ULA claimed they were on track for the previous spring launch date for EFT-1. “The LV for EFT-1 is in our production and launch queue and production is underway. The projected launch date has been agreed to between ULA, LM (Lockheed Marting) and NASA and ULA (and) is on track,” noted noted Dr George Sowers, ULA VP for Human Launch Services, during a Q&A session with NASASpaceFlight.com members. With no clear reason for the launch date moving out to the right, it is possible the launch date simply “matured” out of the contract negotiations between NASA and Lockheed Martin at the start of the year, a period when the mission first moved from its late 2013 launch date into the Spring of 2014. For the purchase of the required Delta IV-Heavy, Lockheed Martin had to work a deal with NASA for purchasing one of the launch vehicles, a deal which is then updated to one between Lockheed Martin and the United Launch Alliance (ULA). Lockheed Martin and Boeing make up the ULA, the joint company is the body responsible for the Delta IV-H. It was also decided back in 2011 that a Joint Test and Mission Operations Team – consisting of NASA MOD (Mission Operations Directorate) and Lockheed Martin personnel – will control this mission. As such, the Lockheed Martin team will perform the entire test flight as a “turn-key” operation, implementing a more traditional support structure that includes MOD for the pre-flight testing support and full responsibility of the real-time test flight operations support from T-0 through splash down and post landing vehicle safing. 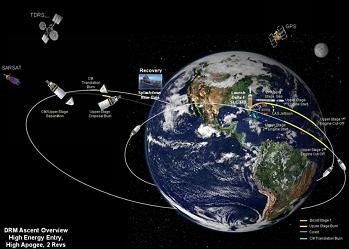 The mission itself – involving two orbits to a high-apogee, with a high-energy re-entry through Earth’s atmosphere on what is a multi-hour test, testing critical re-entry flight performance data and demonstrating early integration capabilities – is a vital step in NASA’s Beyond Earth Orbit (BEO) ambitions. Orion will return home at a speed almost 5,000 miles per hour faster than that endured by the Space Shuttle orbiters, providing a crucial test of the vehicle’s Thermal Protection System (TPS). 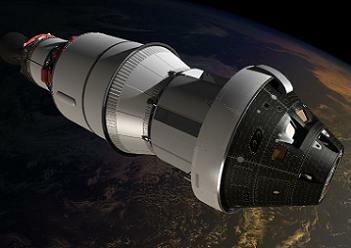 As Orion re-enters the atmosphere, it will endure temperatures almost 2,000 degrees F., with the resulting data being fed into key reviews of the spacecraft’s design, allowing the data to be input in a timely fashion so as to avoid any changes impacting on the 2017 debut of the Orion with the Space Launch System (SLS). However, the EFT-1 mission isn’t just to test the heatshield, because once that element of the flight has been completed, Orion will require the use of drogue and main parachutes to slow its descent, en-route to a splashdown in the Pacific Ocean. 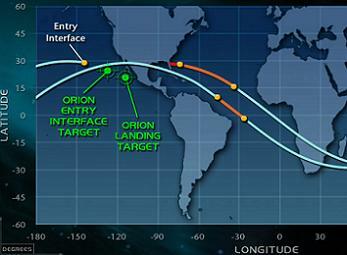 EFT-1 is without a specific Design Reference Mission (DRM) classification – as observed in the latest Orion Concept Of Operations (CONOPS) presentation, available in L2 – but is heavily tagged as the first step in the path that should eventually lead to crewed missions to Mars. “EFT-1: Earth Orbit, High Energy Re-entry: This Lockheed Martin led operation – with NASA providing support and exercising an insight function – will be the first test of the Orion MPCV,” noted the document. Although EFT-1 is separated from the Exploration Systems Development (ESD) mission phase, it is classed as the final step ahead of the ESD “tactical” phase, which begins with EM-1.